Last Wild Card Wednesday of the month. Another CAS (clean and simple) card this week featuring the "Gnome Sweet Gnome" stamp set that came with this month's kit. 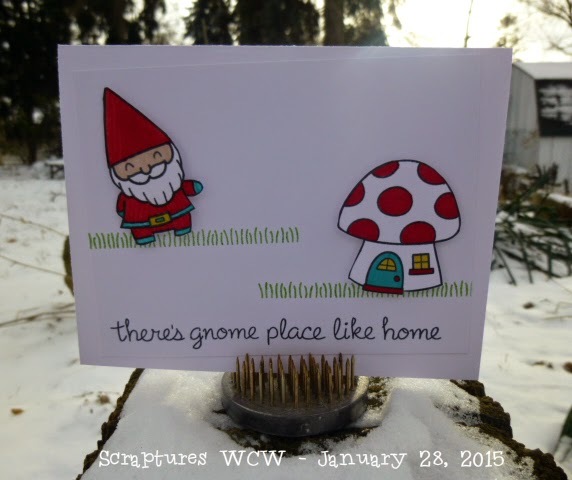 I love gnomes! I have them in my house, in my gardens, I have a plaque in my kitchen that says "Gnome Sweet Gnome." I think Christa knew I would love this stamp set when she picked it for the SCRAPTURES kit this month. Super cute card, love the sentiement. I love the gnome card! So fun. True confession time: I have several sets with gnomes in them and I don't think they ever made it to a card. So cute ...and fun! I can see why you love this set!